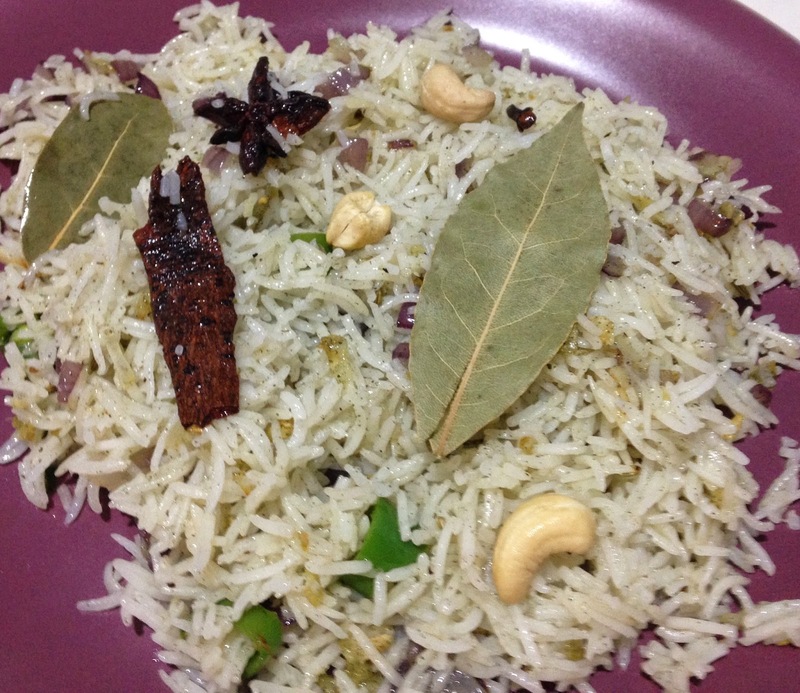 Brinji rice is a wonderful, simple and flavourful rice variety I made in which the main ingredient which flavours the rice is brinji leaves (tej patta or bay leaf). It is called brinji leaf in Tamil. Heat 1 tsp. oil in a pan and fry the cashews a bit on medium flame. Drain and keep aside, let the oil remain in the pan. Wash and cook the rice as you normally do. To follow how I do the same, read How to make the perfect boiled rice. While the rice is being cooked, heat the pan with the oil again, fry cinnamon, cloves, bay leaves, star anise, cardamom and fennel seeds. Before you cover the rice, add this fried whole spices to the cooked rice and let it set for sometime. Heat remaining 1 tsp. oil in the same pan, add chopped onion and fry until golden. Add the ginger-garlic paste, green chillis, salt and mint. Mix well and let cook for 2 minutes. Add the coconut milk and combine well. Turn off the heat and mix the contents with the cooked, flavored rice. Mix well and top with fried cashews and garnish with coriander leaves (optional). Serve hot.